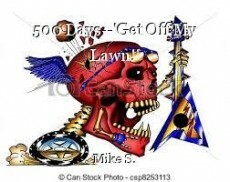 500 Days--'Get Off My Lawn! ', poem by Mike S.
I bought ten acres, and damn it, it just ain't fair! betting I won't, but they'll be losing that bet! You little bastards, get off a my lawn! Recoiling action, and your face is gone! I am the executioner, you'll find it's true! I'm bring down the hammer on your sneaking days! So easy to picture, Mike! Brilliant write!